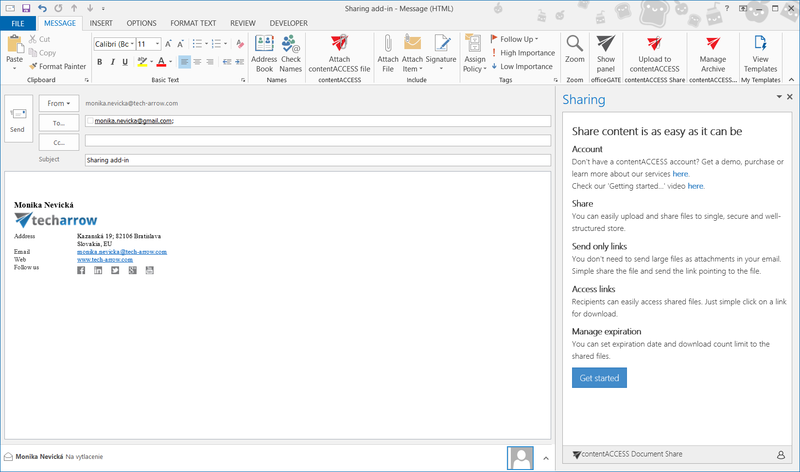 contentACCESS Sharing is an Office Add-in for Outlook and OWA, which helps with large resource sharing between users. The app can be activated in Compose form when the user creates a new message or appointment item. In the Compose form, if the client supports add-in commands, a custom button appears on the ribbon. If the button is not there, the user has to allow the add-in manually in File -> Info -> Manage Add-ins. The add-in can be activated also in a Read form, when the Reading preview is displayed, by clicking on View shared files in the upper right corner. The add-in is able to recognize a normal „HTML link“ and also link represented as text (we are not able to inject HTML into item’s body on mobile and tablets). Important: If customers want to use contentACCESS Sharing or Mail app, contentACCESSLogin must be configured over SSL. In Compose form, the add-in is activated as a new custom task pane on the right side of the inspector window. 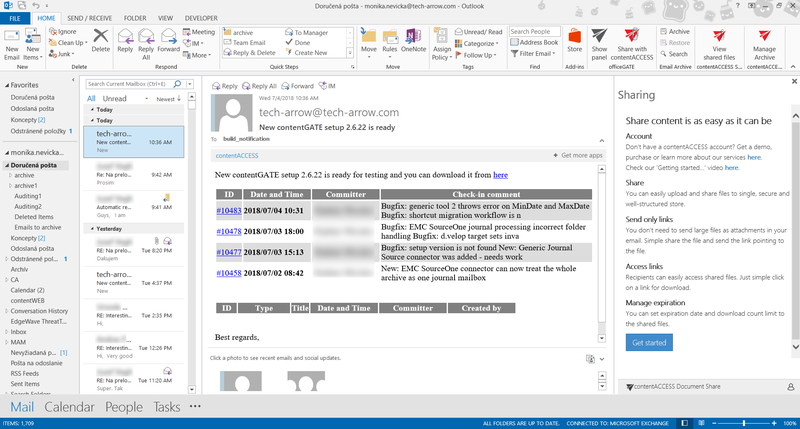 In Read form, the add-in is activated as a new custom task pane on the right side of the Outlook window.